The National Corvette Museum Motorsports Park recently took some flak from its neighbors in the adjacent community of Clark Circle for what they believed to be excessive noise violations. The NCM was even fined for its continued violations. The museum then held a neighborhood meeting on June 9th to better “understand the problem,” which resulted in the hiring of a new acoustic engineering company to take new sound readings of the track. Thankfully, all was not lost. The NCM Motorsports Park found quickly found a solution to its problems– it would erect a berm (a raised embankment) to keep track volume within noise limits even in a “worst case-racing event”. Diehard gear-heads, the NCM Motorsports Park wasted no time and it began construction of the sound-dampening structure on August 25. Incidentally, the museum says it performed an acoustical sound study prior to the track’s construction in 2013 that indicated track noise would not cause a “substantial increase” in road noise compared to the existing noise from nearly highway I-65. As a result, it “did not feel it was necessary to build a berm” at that time. While the museum does not currently own the land where the berm is being built, it is in the processing of purchasing the ten acres of property it needs and the landowner has already given full permission to build the berm. 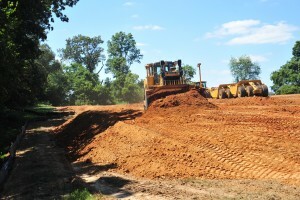 The Motorsports Park plans to have it all said and done in a few short weeks. In the meantime, it continues to be open for operation and all events will continue and run as planned. The Motorsports Park expects to have the results of the sound readings in mid-September, where it will then build additional sound abatement structures. “These structures are not required by our Binding Elements, but our goal is to be a good neighbor and not cause a “substantial increase” in noise,” the NCM said in a release. Wow what a bunch of old crabs. I would be honored to live next door to a race track! I bet it is a bunch of old people. From one ole white hair person to them, GET OVER IT. Or move the hell out!